No commercial description available on this one. 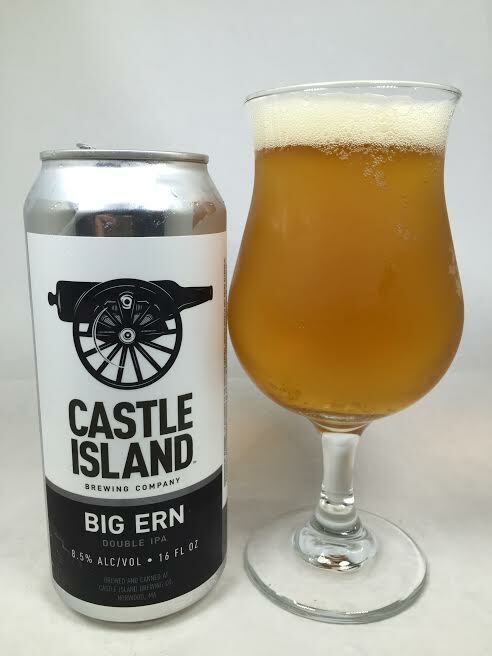 Big Ern is a Double IPA from Castle Island Brewing out of Norwood, MA. You can find a lot of their stuff at local stores, but this was a brewery-only exclusive and their biggest beer to date brewed with Citra, Mosaic, and Columbus hops. Pours a transparent dark orange with less than a finger of white head. Acidic grapefruit and dank qualities on the nose with candied orange and subtle black pepper. A small thud of bitterness on the front of the tongue. Some more orange on the taste too, but not candied like the aroma. It's more of a sherbet or creme flavor which I am really into. It transitions to a small amount of pine and a lot of dankness on the second half. Malts are sweet and very much present throughout from start to finish. The finish takes a unique turn with more of that pine and dank qualities which seems like a weed-covered pine tree air freshener. That's possibly the weirdest simile I've ever written, but I'll challenge anyone to tell me otherwise. Mouthfeel is full-bodied. Considering it's an 8.5% DIPA, it isn't thick or syrupy. It feels like the big beer it should be, but doesn't have any alcohol or warming at any stage. It feels calm in the mouth with the right amount of carbonation. When a beer is named after one of the best Bill Murray characters of all time, it better deliver. Castle Island has succeeded in that aspect with a big boy of a DIPA while retaining high drinkability and flavor. It's not your typical New England juice nuke, but it does have more balance between the juice and hops as opposed to others. Definitely worth a look if you have access.